[04:36:25] <tjtr33> hello, whats md5sum of binary.hybrid.iso? 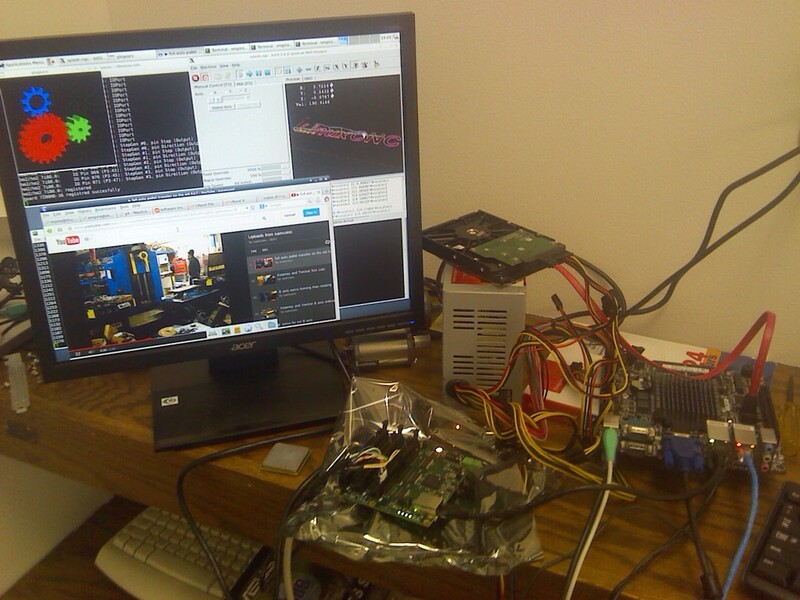 [13:15:46] <skunkworks> cradek, win32diskimager also works in windows 7..
[14:05:44] <jepler> linuxcnc-build: ^^ let me know how that works out, OK? [14:06:24] <jepler> when I get back from this trip, if no more review items or outright objections turn up in my e-mail, I intend to push this to master branch. this would be sunday/monday. [14:37:42] <cradek> if I put commented-out sources in linuxcnc.list, they show up as unchecked/unselected in synaptic. this is nice, because I can put the buildbot alternatives right there. [14:38:41] <cradek> I'm also installing "nopaste" by default, which is an automatic pastebinner. so you can do things like "dmesg | nopaste" and it gives you a URL in return. [14:39:37] <cradek> is the editor bad, or just the name? [16:13:08] <skunkworks> I just pulled the wheezy -rt kernel from the synaptic package manager. [16:18:46] <skunkworks> I had the latency-test running for days - it was around 50us.. but when I started running youtube - it jumped..
[16:22:18] <skunkworks> still totally useable. [16:26:26] <skunkworks> I could try it. [16:27:23] <jepler> hmm, I don't immediately find the patch. [16:28:53] <jepler> does anyone know if either of those latency-graphing programs can be started in a single-thread mode? 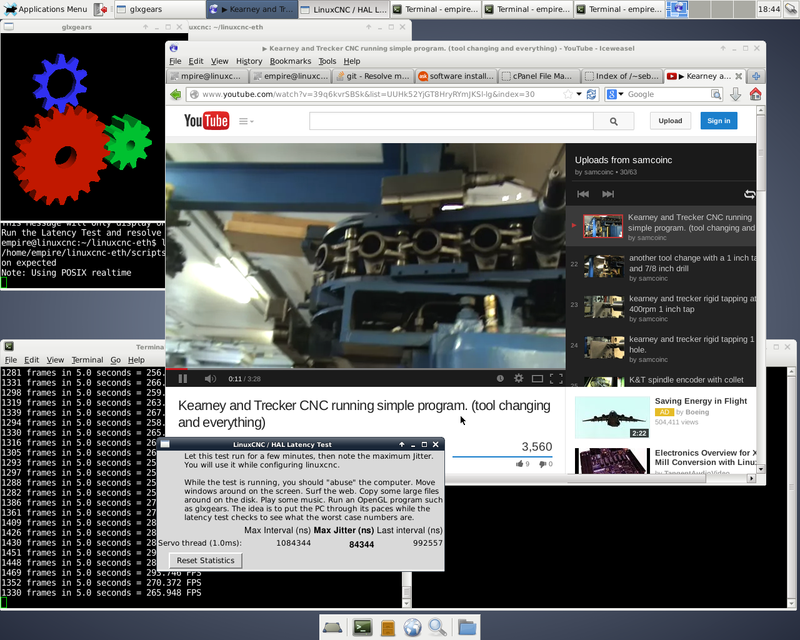 [20:02:41] <skunkworks> jepler, no real improvement there.. - creeped up to 80us..
[20:09:01] <SkapiN> I have a hard question about LinuxCNC step generation. Perhapse someone can help me to find out some trouble. My latency is 20,000. My driver allow 10,000 as step and time. So i setup like that. I setup my computer with stepconf to use 45,000 latency jitter. [20:12:21] <SkapiN> (with 25,000 and same max speed i get perfect cycle, but with less max speed i got some delay). [20:17:49] <SkapiN> cradek: explain a bit more, please. [20:23:33] <cradek> if you are using software pulse generation, the base period is the only time the output can change. it is a periodic event whose timing is fixed. [20:26:24] <cradek> are you having an actual observed problem with positioning, or are you just imagining that it must be there because of what you see on test equipment? [20:27:06] <SkapiN> cradek: just good equipment. i knwo perhapse it's nothing, but the behavior is not "attended"
[20:27:07] <cradek> can you turn your microstep setting down? 128 is very silly and does you no good. [20:27:53] <SkapiN> so we can avoid driver trouble. [20:28:48] <cradek> I think you are inventing an imaginary problem? [20:31:59] <SkapiN> na, you are just changin the Freq. [21:05:20] <jepler> you might imagine some other design in which the driver calculates the amount of time to sleep, and then sleeps that long; but that becomes complicated when you have 3 or more stepgens, and it also harms activity like counting encoder pulses, where your main interest is in polling frequently enough that you don't miss any pulses.